It's often difficult to communicate the results of a complex mathematic formula to operators. If the communication is unsuccessful, no action is taken. We had a clause in a contract with a construction firm concerning the maximum length of the line for meals. The line had to be less than a 20 minute wait at dinner. I spent two days gathering data on mean service times and arrival rates. After running the calculations, I went to Earl our General Manager with the findings. He was a retired Army Sergeant with years of experience in mess halls. The site superintendent had a great rapport with Earl. We engaged the chef in our conversation. He understood the line was too long and mentioned a spot on the wall which meant the wait would be unacceptable. I counted the number in line and his spot was one person off the number I calculated. The chef insisted the waiting delay was temporary and only lasted for 15 minutes maximum. Earl would not allow for a concession. The workers were laying rail ties and were not a patient bunch. He decided to call in the top foreman from the largest crew to discuss alternatives. We got our solution in about 20 seconds. The foreman decided the buses all left the camp at the same time in the morning and returned each night together. He ordered the buses to depart 5 minutes apart in the morning and evening to allow a more workable arrival rate. Problem solved! Two of the simplest profiles for a sales forecast are Slammed and Dead. It's pretty easy to order food and beverage and schedule staff for these two expectations. A simple spreadsheet with date, dow, sales and special event is all that is needed to perform percentile analysis. I'd prefer at least two years of data. Sort the file by sales. Divide the number of data points by 5. Now split the sheet in 5 parts. Note the highest and lowest sales figure for each partition. That's all we need for this analysis. Save the sheet and start a new one. The left column is the Description, next column is High, then Low, then Midpoint. Fill in the Description with Slammed, Busy, Typical, Slow, and Dead. Fill in the High and Low numbers with the data points taken from the master sheet. In the Midpoint column, you'll create a simple formula as follows: Midpoint=(High + Low)/2. Create a staffing chart for each of the 5 Midpoint sales levels. Take a look at the upcoming week. Label each day as Slammed, Dead, etc. Use the staffing chart and the budget food cost % times the sales estimates to complete the forecast. 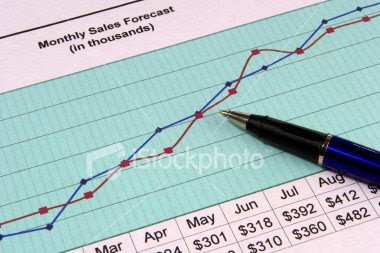 The result of this work is a simple forecast for sales, staffing and food cost. Once you're comfortable with the profiling method, you can change the number of descriptions. Perhaps you could have 7 or as many as 9 increments. The food cost % analysis can be extended to beverages, supplies, and other categories. All categories should be controllable operating expenses. Seasonal operations may want to create a off-season chart and a peak season chart. If you ever dig deep into your restaurant's information mine, you'll locate plenty of valuable ore. Since most money is made and most opportunities are lost on busy days, it's always wise to focus on high volume days. Take the day of the week with the highest sales (week in and week out). For this busy day, enter the date and sales figures for an entire year in a spreadsheet. Chart the information using the Line method. Locate the high and low sales figures and note the dates. Pay specific attention to holidays, seasons and special events in your area. Go a step further and calculate the average, median and standard deviation. Most days will fall within one standard deviation (plus or minus) of the average. In fact, it is rare to find days which do not fall within two standard deviations of the mean. Most likely, you will find specific events which caused the high or low figures. You can even rework the numbers excluding those data points. If you have a line out the door during peak hours on these busy days, you can turn the dining room faster through intelligent prep. Know your menu well. Prep the popular items ahead of time for the average sales level. Don't produce less. We're going for a faster turn which will increase your volume. It is especially critical to have appetizers and desserts ready to go fast. A quick response to the initial order for starters and the final order for dessert have a major impact. By increasing focus on your busiest night, you can get a higher sales number when the opportunity is greatest. Make sure patrons do not feel rushed and prevent a long wait time for the check. Your faster turns will produce greater sales. The best route to a better food cost percentage is a bigger sales figure. Perhaps you are visionary. The simple way to evaluate your forecast accuracy is the employee schedule. How often are you asking people to work overtime or to leave early? If this is a daily occurrence, you need a better schedule which requires more work in the forecast department. If you have little or no statistical analysis background, you can still become a great forecaster. You need to keep score. Document each week's forecast and save these in a folder or a spreadsheet. Keep track of the important factors. Maybe the weather is key. Day of week is most important. Any special events in your locale with a big impact on business should be noted. Advertising changes are extremely important. You need a forecast of covers by meal period. This information should be compared to actual counts. Calculate the difference in count and as a percentage of actual. The next step involves analyzing variances. Highlight very low variances and very high variances. You want to improve the overall performance. Identify weaknesses and make adjustments in future forecasts. Try to imitate accurate forecasts. Find out what you did right on low variance predictions. Building stronger forecasts is a game of keeping score and improving your gut feel with a reality check. As your numbers improve, you will be tempted to stop the documentation process. Don't stop! Life is dynamic. Look for new patterns. Imagine you are on the New Jersey shore in 1997. It's slightly past the peak summer season. Our restaurant specializes in crabs. They are sold by each, half dozen, dozen and all you can eat. These crabs are available by size. We're at the loading dock and we've just received 5 bushels of live crabs. Carefully selecting the best crabs and accurately pricing them is the key to this simple menu. The cost per bushel is $55. Now the fun begins. What did we get for our $275? Three workers grab the bushels and take them to a room with a clean floor and two tables. They pour the crabs on the floor and watch as the crabs run in all directions. The crabs are grabbed and placed in bus pans marked MEDIUM, LARGE, JUMBO and X-JUMBO. The crabs in the medium pan average 4 to 6 ounces; large crabs run between 6 and 8 ounces; jumbos are 8 to 10 and the rare x-jumbos are over 10 ounces. Our primary focus is on menu pricing and we need to get top dollar for the larger crabs. The medium crabs will be offered in the popular all you can eat menu option. Large crabs and jumbo crabs are mostly ordered by dozen or half dozen. The x-jumbos are purchased individually. It is time to find out the proper prices for today's menu. We begin by counting the crabs in each of the bus pans. Today's catch yielded 130 Medium, 185 Large, 56 Jumbo and 14 Extra Jumbo. With the smaller crabs, customers work less on the claw meat and order more crabs. They eat more bushels. Savvy Maryland, Delaware and New Jersey patrons demand larger crabs. My client prefers a pricing method which assigns the midpoint weight to each crab in the bus pan (5 for medium, 7 for large, etc.). We got 2,603 ounces for our $275. The menu prices will use the 10.56 cents per ounce and our goal is a 35% food cost. We'll sell the Jumbo crabs for $16 a half dozen. A dozen Large crabs we'll price at $25. The popular $19.95 all you can eat special will yield a 39.7% food cost (average patron eats 15 medium crabs). Pricing the menu accurately is essential with live crabs. Cost per bushel, weight of graded contents, and competition impact the decision. This restaurant takes the time to price the menu and they have prospered in an intense competitive environment. My corporate background includes a nine year stretch with Sodexho. My field work was at major construction projects, oil production facilities, Calgary Winter Olympics and the Alaska Railroad. We served hungry men over 5,000 calories a day. They worked in the freezing cold of Alaska, Alberta, British Columbia and Colorado. Our sites served 3 to 4 buffets a day. We had very tight cost control due to the nature of the industry. Our contracts were won in competitive bidding wars against as many as 20 companies. Serving all-you-can-eat (AYCE) buffet style meals to voracious diners is half art and half science. In our company, I was the scientist. Most of our projects were staffed with marvelous artists. I can vividly remember their efforts during the holiday season each year. The four key people in any successful high volume buffet production team are the chef, the baker, the butcher and the chef de garde manger. It is the job of the baker to make the patrons want dessert before they ever take their meal. To accomplish this task, we staged our buffets with the pastries first. The best bakers were showmen. They worked their magic every night with batters and pies and loaves of bread. Most of the purchase dollar in our business was spent with purveyors of meat and seafood. Our best chefs worked closely with their butchers to optimize purchases based on market conditions. We served T-Bone Steak twice a week on every Canadian and Alaskan site. The butchers would buy a variety of cuts: sides, hinds, long loins and short loins. They looked at each cut as a source for steaks. They knew the percentage yields and the number of T-Bones from each cut. Depending on market prices, they bought enough steaks (through huge cuts) for the week and used the trim in stews and ground beef. For this style operation, it is essential to have a completely separate refrigerated area for leftovers. Ideally, the bulk of the food left over may be served at the next meal period. The chef de garde manger sliced cold roasts for sandwiches, used leftover chicken in salad. Shrimp and crab was spread lightly over well presented pasta salads. Every day, I watched the coming and going from this cooler. At a good site, there was never much food in this storage area. The same was true for bakery items. Each baker had his own use for the previous day's leftovers. Some liked bread pudding and others liked to use bran muffins. Most of my buffet clients serve Sunday brunch or special events. There is little opportunity for reusing over production. Food won't last until the next week. The best chefs still display elaborate desserts in a prominent location. They use trained cooks to slice meats carefully. Salad bars are presented with well made dressings and garnishes. The best buffets have a favorable impact on food cost results. Unfortunately, many buffet operations hurt the overall food cost results. If your operation uses the weekly buffet as an excuse for poor results, I would consider changing the buffet style meals to banquet style. Portion control in a buffet operation is an art. Careful calculations are necessary to prevent over production.